I am visiting Florida right now and want to thank you. Your website has been a great help - full of interesting tips. I loved going to Ana Maria Island - what a paradise! The beach is fantastic. I went to the Sandbar Restaurant for lunch. What fun it was to eat right on the beach. I also want to let you know about another restaurant we found last night - Stonewood. They have several locations in Florida including two in the Sarasota area. We visited the one in Bradenton on Cortez Road. The food was delicious and very reasonably priced. They have "Happy Hour" until 7:00 weeknights. Get a glass of wine free with purchase of a glass or $1.00 off a beer. Join in and write your own page! It's easy to do. How? 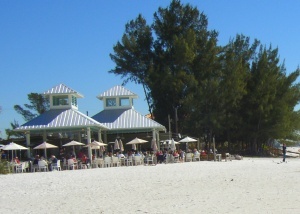 Simply click here to return to Anna Maria Island.